Chicagoans have all heard of the following pizza places: Gino’s East, Giordano’s, Home Run Inn, Lou Malnati’s, and Pizzeria Uno. Chicagoans also usually run a gamut of opinions on each of these respectively or sometimes have the same collective opinion that these are all “commercial” chain pizza restaurants that don’t reflect how good Chicago pizza can get. I can respect that and sometimes I feel the same way. 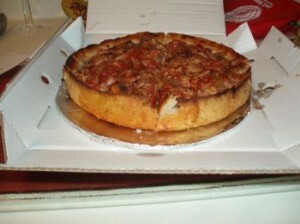 But last night I had Lou Malnati's deep dish pizza, and it was one of the best I have had in awhile. The crust was perfect. Perfect! It was so delectably satisfying, such crispy fun to bite into, I ate all of it immediately instead of finishing all of the slices I wanted and then waiting to see if I was still hungry enough to eat the crust. The cheese and ingredients were a perfect harmony of salty and savory, and even the soupy sauce tasted great. But really, how good was the pizza? I ate 3 slices of it. In one 30-minute sitting. And I weigh under 130 pounds. First I placed only 1 slice on my plate. I figured I would come back for seconds, but maybe my tall glass of Pinot Grigio accompanying the pizza would make the 1 slice sufficient. I finished the pizza, then the drink, exhaled a small belch, waited a few moments, and cut the next slice. I finished that one and thought that would be the end of it. I poured my next glass and quietly watched a few minutes of True Blood, paused the show, and cut half of a third slice. Five full minutes later, I realized who was kidding here, and ate the last half. Overall, I’m pretty pleasantly surprised I had such a great time eating pizza from “one of those” pizza places. Was my incredibly pleasing Lou Malnati’s pizza-eating experience a freak occurrence, or is their deep dish really that good usually? 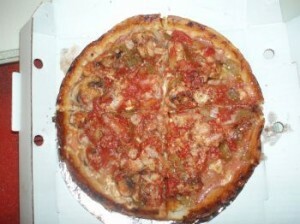 Lou Malnati's gets 6 of out 8 slices.